"Where does the music go when it all becomes silent?" That's the kind of question one might expect from a visionary artist known for pushing the musical boundaries. 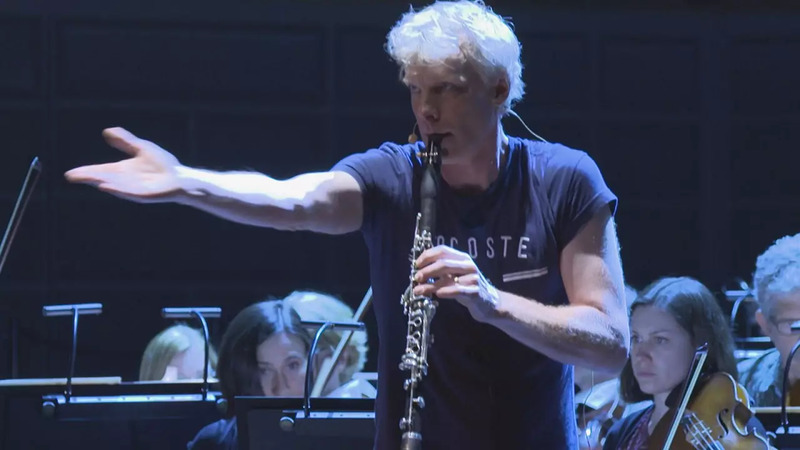 The charistmatic Swedish clarinet virtuoso and conductor Martin Fröst takes the audience on a daring journey, through times and styles,while exploring new sound worlds. “When you do a new project like Retrotopia for example it's something that is emerging and you I know where it goes," Fröst tells Musica. On his quest for new ways to present and combine music, Martin Fröst recently world premiered Retropia, his latest project in the Stockholm Concert Hall, accompanied by the Royal Stockholm Philharmonic Orchestra. “I feel like I'm sort of a master of ceremony. I'm sort of guiding through this journey,” enthuses Fröst, his energy as boundless as his artistic imagination. "Retrotopia are two words in one: Retro and Utopia. I think the climate that we are all living in, we are super scared of what is coming and very much fond of looking back so I'm starting in the classical repertoire with Mozart and Beethoven." "And then after the break I'm just pulling everything apart," the maestro explains, "...and say let's try to go now on the very, very fragile journey...and then everything is twisting. There are no rules anymore. That's the big question: Where do we go from now?" Fröst seeks answers in the music and works together with composers to create unique programmes. Among the visionary pieces is Emerge, by composer Jesper Nordin. With the help of a motion sensor he controls a virtual orchestra with his movements, creating a whole new palette of sound colours. "In Emerge me and Martin have been trying to find the future of music, blend technology through my technology gestrument - gesture - instrument where you can play on a virtual orchestra while playing on his clarinet and conducting the live orchestra and to find new ways of expression," says Nordin. "It feels like sculpting on the DNA of the music, which fits me quite well. I sometimes felt: Oh my god, I'm more like a sculptor than a musician," adds Nordin, reflecting the boundary-breaking instincts of his collaborator. And to where will this unique creative force lead? Not even Fröst knows, and that's how he likes it: "When I'm trying this new project and it starts... Woah!.. where are we going? What is this emerging to? I enjoy this uncomfortable feeling even on stage because then I'm anyway alive."